Your hostel booking will be refunded, minus a 5% cancellation fee. To cancel a booking, please contact the Hostel via phone or email. A cancellation fee equivalent to one nights' stay per person is applicable. If you cancel within 24 ours you need to contact the hostel directly by phone or email. Please allow at least seven days for processing a refund. * If you booked a special deal ( such as weekly rate), package or booked a stay during a peak period or with a minimum nights' stay, please check the specific terms and conditions of the individual product. Some of these may be non-refundable or have other individual conditions. If people in groups are arriving separately, the first person to arrive will be required to pay in full for the whole group as well as any bonds applied. If you are staying with a Group Booking please refer to the House Rules as the above terms and conditions do not apply to you. Office hours 8 am to 12 pm then 4 pm til 10 pm. Check-in time is between 4 pm and 10 pm. Check-in outside of the above hours will require a valid credit card payment and prior contact with the hostel to arrange the front door code. Check out time is before 10 am. No late checkouts and a fee of 1 nights accommodation if late. 1 key is issued per booking. Any extra keys require a key deposit of $20 per key. Lost keys incur a $30 payment. All guests must provide a valid ID on arrival, which includes Passports, KeyPass, Australian or International Drivers Licenses. Student ID cards cannot be accepted as suitable ID. Noise Curfews are in place for the good of all. 10 pm throughout the hostel property. A Group is considered to be more than 6 people. All Group reservations are to be submitted in writing via email to Bells Beach Backpackers and will be approved individually. The balance is due at least one month prior to arrival. The Group agrees to adhere to Bells Beach Backpackers House rules. The comfort, safety, and security of our guests are our highest priority at Bells Beach Backpackers. Any guest who compromises the comfort, safety or security of other guests, staff or local residents will be requested to leave the hostel premises and will not be offered a refund. 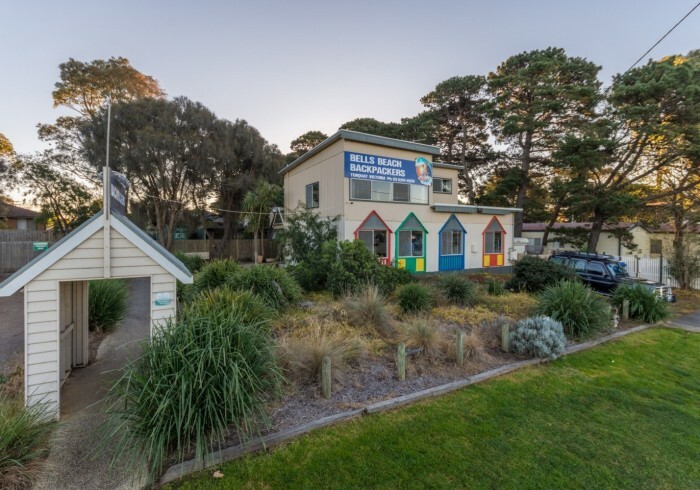 *being clean and tidy is part of comfort and Bells Beach Backpackers expects all guests to maintain a standard of cleanliness in bedrooms and all communal areas. Upon check-in, guests will be notified of the FRONT DOOR CODE. This is a six-digit number, which provides access to the Hostel. Please keep this code private! The front door must be closed outside of reception hours. Guests are not allowed to reveal the code to any non-paying resident. The door to your room must be locked if you are the last person to leave it. Please have your key on you at all times to prevent from being locked out. A pre-authorization of all credit cards is done at the time of reservation. All bookings must be paid at the time of arrival. $1.00 surcharge applies to all EFTPOS, Visa, Mastercard payments. International Cards incurs a fee of $3.00. Long-term accommodation is limited to 21 days and then on review. If you plan on staying with us long term then it is your responsibility to ensure you have booked for the period you want. It is not the hostel's responsibility to ensure you have a bed. A cancellation fee equivalent to one nights' stay per person is applicable. If you cancel within 24 hours you need to contact the hostel directly by phone or email. Please allow at least seven days for processing a refund.